Children can lose their fathers to war in more ways than one. This is partly what Pip McManus’ multimedia work Reconnaissance is about. The clues are in the two tiny photographs of her parents – separate, not together – that hang where the main part of the work is installed. This poignant connection to the artist (their absent child) aside, the work speaks to two strong themes: the extraordinary demands made of combat soldiers, and the diabolical relationship they are forced to have with foreign lands and their people. McManus tackles her large subject with a very particular story: the war experience of the father she didn’t know, not because he was killed but because the war so damaged him. He was a pilot for the Royal Australian Air Force during World War II, flying Catalinas, amphibious planes able to take off and land on water. This versatility combined with long-range fuel tanks meant missions of long duration, up to 30 hours. McManus tells us in her artist’s statement that most them lasted 16 to 20 hours. What her video work manages to convey in just 12 and a half minutes is a sense of what it was like to be on such a mission: the constant roar and vibration of the engine noise (you can literally feel it in the viewing room), the physical confinement, the heightened tension of imminent danger (as well as, no doubt, the heavy awareness of their work’s lethal nature), the exhaustion. This is contrasted with a dreaminess and nostalgia for the moments of reprieve. In a few simple scenes the seduction of the tropics is evoked. We see the men at their base at East Arm, Darwin with a view across the Arafura to Yirra / Catalina Island; we see their manly vitality and camaraderie. We see their enjoyment of being in a foreign place – the Philippines, where their deadly missions took them; like any tourist they photograph the thatched huts, the Filipino passers-by in their distinctive conical hats, had themselves photographed befriending local children (right). But the simplicity of this connection was deceptive: those very same children may later have died under their bombs, one of the haunting facts that left the men who survived broken in spirit, the best and worst of themselves expended in the distant tropics. The final sequence is underwater, filmed by a maritime archaeologist as he traces the outline of a submerged aircraft wreck: we need nothing more to complete the profound memorial quality of the work other than the end titles which give us the name of McManus’s father, Flight Lieutenant Bruce White, 1917-1998, and the brutal number of civilians who died in the Battle for Manila: 100,000. Such are the losses of war, even when it is ‘won’. The memory of both soldiers and civilians is also honoured in the installation in front of the screen: a map of the island nation of the Philippines is delineated by conical hats covered with military-issue maps (printed on cloth in case the soldiers found themselves ditched into the sea). McManus has created a work of poignancy and power with perfectly judged editing of archival footage accessed at the Australian War Memorial and photographs and documents found among the personal effects of her father. This is matched by subtle shifts in the soundtrack (no music) and an effect she created by filming strips of foil falling across the aircraft scenes. This is a reference to an actual technique of throwing aluminum foil out of the planes to interfere with enemy radar detection, but it doubles in McManus’s work to amplify the sense of war’s deadly business. Reconnaissance is showing at Watch This Space on George Crescent till 3 June. 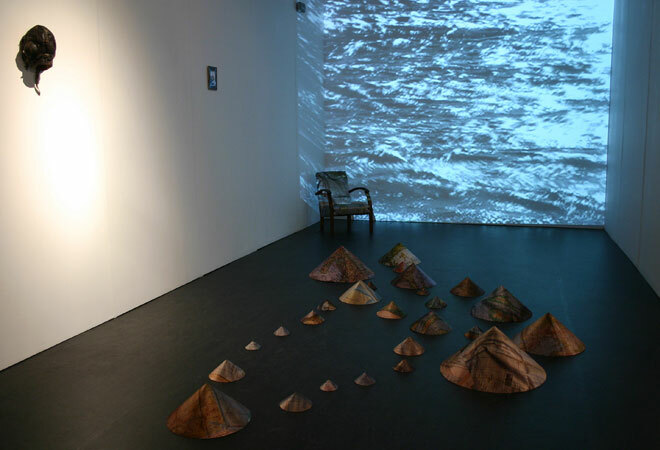 Below: Installation of the work as seen at the Chan Art Gallery in Darwin. 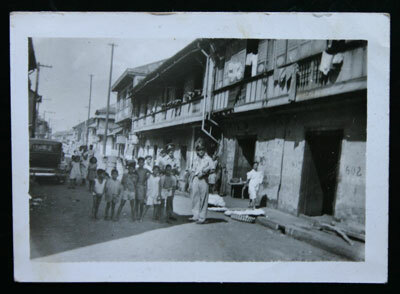 Reconnaissance was originally presented as part of an exhibition involving Filipino and Australian artists, shown in Manila under the title Immemorial. All images courtesy the artist.